By Step Rd of South Australia. Fresh and lively with luscious stonefruit and biscuit characters, some mid palate sweetness complemented by a creamy mousse and crisp, clean finish. Established 1985, the Step Rd wineworks are fortuitously positioned to collate harvests of the finest grapes from local vineyards at Langhorne Creek and splendid sites within Adelaide Hills. 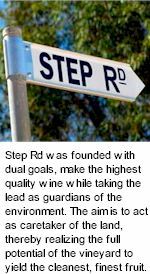 Step Rd was founded with dual goals, make the highest quality wine while taking a lead as guardians of the environment. Aromatic, balanced and revitalizing, a superb aperitif style that drinks well alongside canapes, smoked seafood or chicken caesar. Step Rd source fruit from the finest vineyards in South Australia. The classic combination of high altitudes in Adelaide Hills, 400-500m above sea level, high winter rainfall and cool summers, produce fruit of supreme quality. Shallow, shaly soils, washed by centuries of rainfall, ensure low yielding vines, with intensely flavoured fruit. Long, cool ripening periods, with night-time temperatures as low as 3-4°C, allow fruit flavours to develop and concentrate to their optimum level. Showing elegance and finesse, undoubtedly this region produces some of Australia’s finest white table wines. The Step Rd winery was built with dual goals, wine quality and environment protection. A 5,000 tonne winery its layout and operation were designed for efficiency and resource, and to be mindful of the occupational health and welfare of the staff, and the environment. All liquid waste is stored in plastic-lined dams to prevent seepage into the precious water table, before being treated to remove damaging chemicals and salinity, then recycled as irrigation on the vineyard. Similarly, all solid waste of skins, stalks and seeds are mulched and returned to the vineyard to enhance and improve the soil, as well as reducing the irrigation requirement by up to 25%. Step Rd Winery is not only the pinnacle of winemaking quality but is at the forefront in the conservation of the environment and that extremely valuable and diminishing resource, clean water. 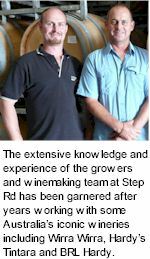 Step Rd produce some exceptional, well balanced, fresh, fruit driven wines and skilful blends showcasing the best Australian varietals including Crystal Brook, Katherine Hills and Trig Point. The extensive knowledge and experience of the growers and winemaking team has been garnered over many years working with some Australia’s iconic wineries including Wirra Wirra, Hardy’s Tintara and BRL Hardy. The small but passionate team bring a mix of local and global winemaking expertise. The philosophy is simple, to act as caretakers of the fruit, to understand and realize the full potential of the grapes which come into the winery and produce wines with structure, style and balance. A close consultant to Step Rd, Stephen Pannell is one of Australia's foremost winemakers, he has made some of Australia's most memorable wines and has worked alongside numerous overseas vintages at places such as Domaine des Comtes Lafon, Chateau Mouton Rothschild and G.D. Vajra in Barolo. Other highlights in Stephen’s career include winning the title of International Red Winemaker of the Year at the International Wine Challenge in London, winning the Jimmy Watson Memorial Trophy at the Royal Melbourne Wine Show, twice winning the Max Schubert Trophy at the Adelaide Wine Show as well as being listed as one of the 50 most influential contributors to the world of wine by Decanter Magazine. Warm summers, moderate winters, dominant winter rain and low humidity characterize McLaren Vale's Mediterranean climate. This outstanding region has a world class reputation for Shiraz with its wines renowned for ripeness, elegance, structure, power and complexity, making a consideration of Mclaren Vale fruit a must for the Step Rd winemaking team. The superb warm climate of the Riverland, commitment to viticultural quality through worlds best practise in irrigation, clone selection and vineyard management techniques, lead to the production of generous fruit driven wines. In particular Chardonnay, Shiraz, Cabernet Sauvignon and Merlot. Harvests of full flavoured fruit which in the best vintages, can find their way into Step Rd wines.